When it comes to dressing up in costume, what could be a better choice than going as Donald Trump? Not only is the U.S. president the most recognizable person in the world at the moment, but his qualities also allow for a great deal of creativity. Depending on one’s politics, a Trump look can be heroic, frightening or utterly ridiculous. You don’t have to be American to recognize Trump’s costume potential. 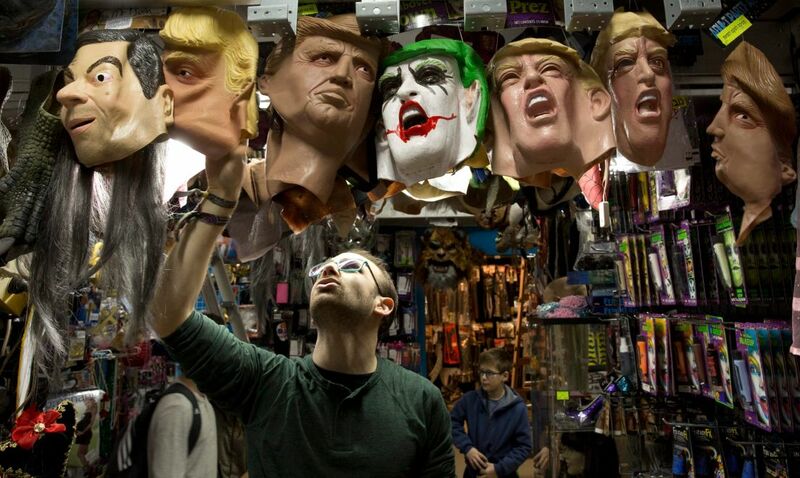 Just as the president has been a popular pick for Halloween trick-or-treaters in the United States for several years now, many Israelis are preparing to get their full Trump on as the Jewish festival of Purim approaches. Those planning to do so will have to move fast, though. Whether it’s the fact that the flamboyant, controversial U.S. president is constantly in the news and on people’s minds – or that his decision to declare Jerusalem the Israeli capital and to move the U.S. Embassy has made him a fan favorite – Trump masks are selling out in costume stores. Weeks before the Jewish holiday, which falls on March 1 this year, a quick market survey found that online suppliers and brick-and-mortar stores were either running low on their supply of rubbery Trump faces or had sold out completely. In the expansive and well-supplied Effect store in Herzliya, however, there is no such shortage. Owner Ronen Efrima is a veteran in the costume business and anticipated the popularity of Trump as a costume choice, stocking up accordingly. If you ask for a Trump mask in his store, there are five different options to choose from, including a mask that combines Trump’s face with “Batman”-esque Joker makeup – perfect for those who find the leader of the free world literally monstrous. Foresight, Efrima explains, is key in his business, since the big trade shows take place some six to 12 months ahead of Purim. Riding the crest of what was popular in the United States during Halloween isn’t enough. Demand for Trump costumes was extremely high in Purim 2017, following the 2016 election and January inauguration. Efrima was fairly certain that popularity would continue into 2018, so he placed a big order. 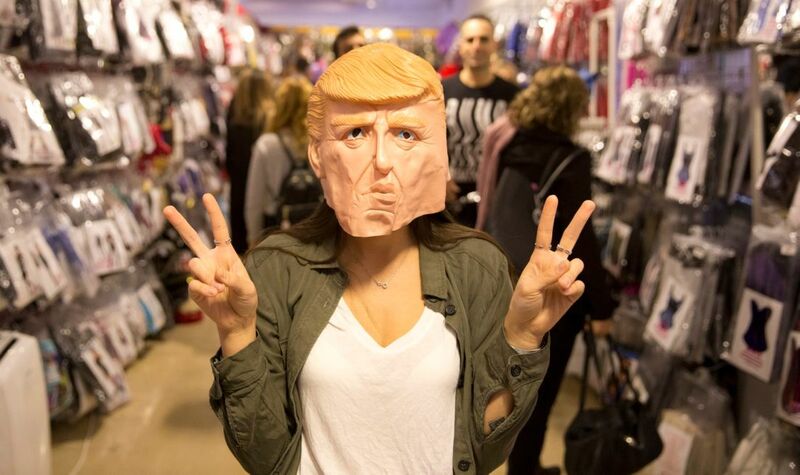 Last Purim, Trump masks were everywhere – either available locally or by ordering Halloween remainders online from the United States, for the more complete Trump look. 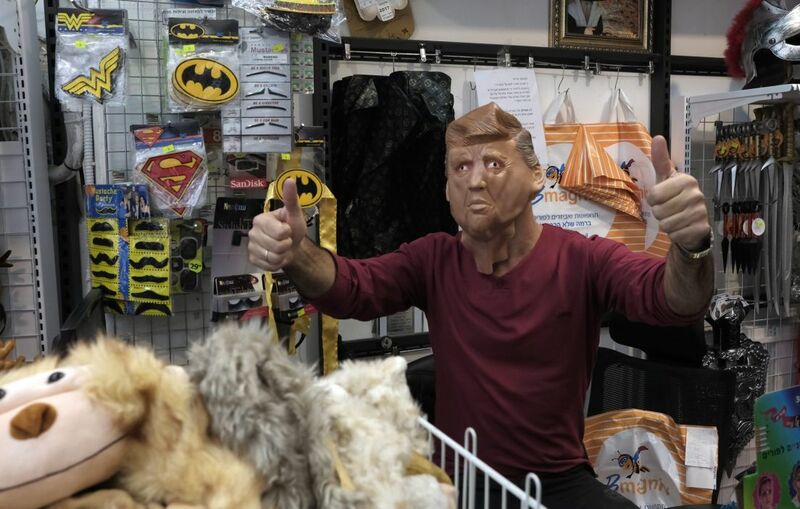 Unlike Efrima, many costume store owners seemingly didn’t anticipate the ongoing interest in Trump and so only ordered 20 or so masks, which in many cases have been quickly snapped up. Those who planned ahead, of course, could easily obtain a Trump mask from overseas. 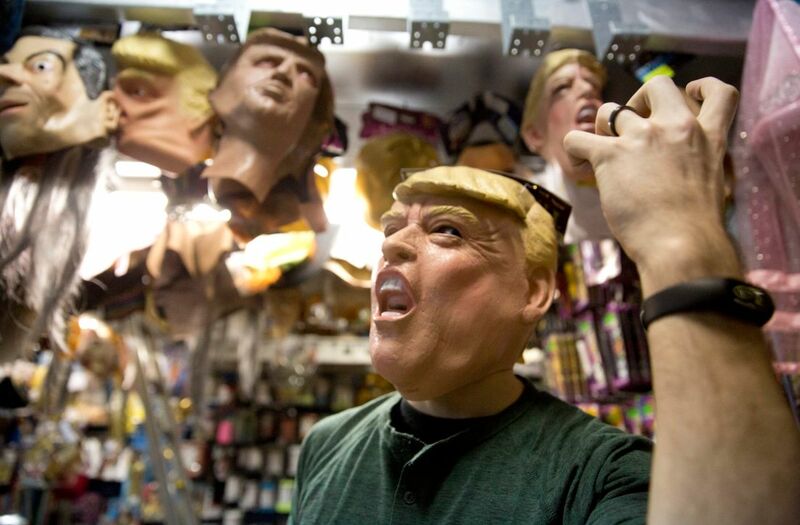 Increasingly, Israelis are sidestepping the local merchants when it comes to Purim costumes, ordering instead from websites like China’s Alibaba, which offers a large range of Trump masks – everything from a scowling, tight-lipped Trump, to one who’s yelling with his mouth wide open. This year marks the third Purim running for Trump costumes to be in demand. Even back in 2016, when Trump was part of the pack of Republican presidential hopefuls, his larger-than-life persona inspired Israelis to dress up as the unlikely presidential candidate. That year, Trump costumes were DIY affairs. Despite his prominence as a reality show figure, there were no premade costumes or masks available. Those who wanted to look like “the Donald” had to create the look themselves. Last year, he recreated the look as a senior because, he admits, “I couldn’t really think of a new idea.” Second time around, he demonstrated his “stable genius” skills by joining forces with a friend who was dressed like a Mexican, but with a cardboard “wall” around him. It went over so well that if he doesn’t come up with an exciting idea for this year, Schejter may very well be Trump for a third time. But Trump isn’t the first U.S. president to generate such high interest at Purim, according to Efrima, who has sold costumes through numerous presidencies. The current White House occupant would probably be very unhappy to learn that Barack Obama masks were just as popular during the previous incumbent’s term, particularly 2009, the year he first entered office. “Even today, I’m still selling Obama,” Efrima says. Other presidents sold briskly in their heyday, he adds, particularly the most controversial ones – Richard Nixon and Bill Clinton. What about hometown politicians like Prime Minister Benjamin Netanyahu? Sadly, Efrima says, they are nearly impossible to obtain. “If there were masks of Bibi and Sara [Netanyahu] on the market, sales would be through the roof,” he sighs, real regret in his voice. The mask-manufacturing business isn’t foreign-leader friendly, he explains. In fact, it’s nearly impossible to find mass-produced masks of even long-standing and visible non-American political figures, hence why there are so few on the market. Next year, though, there may be an interesting exception to that rule – one that reflects the general nervousness about a possible global confrontation.